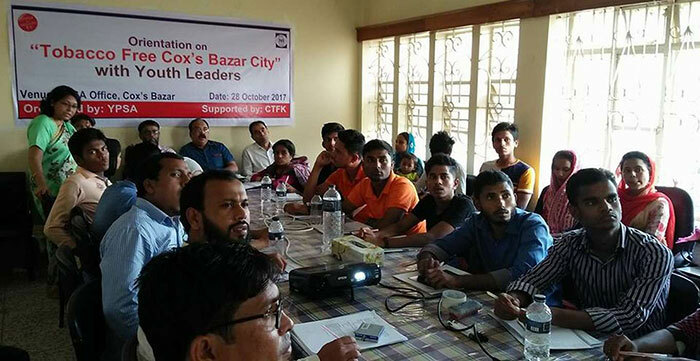 An orientation workshop on Tobacco Free Cox’s Bazar City with youth leaders held on 28th October at YPSA office, Cox’s Bazar. The objective of the orientation is to motivate the youth leaders to provide their support for implementing the tobacco free city in Cox’s Bazar. YPSA discussed harms of tobacco use, Tobacco control law, initiatives of Cox’s bazar municipality, concept of tobacco free Cox’s Bazar city, responsibilities of youth for establishing tobacco free city and social media campaign. Around 21 youth participated in the orientation workshop and they gave their consent to work for developing model tobacco free Cox’s bazar city as volunteers and they signed in the banner of tobacco free Cox’s Bazar initiative. Dr. Mahafuzur Bhuiyan, Grant Manager, CTFK, Mr. Sharf Uddin Ahmed, Chief Executive Officer of Savar Municipality, Mr. Riasat Riaz from CTFK, Mr. Mahabubur Rahman, Director (Social Development) of YPSA and Mr. Palas Chowdhury, Director (Finance) of YPSA were present as guest. Ms. Nasim Banu, Team leader, Tobacco Control Project of YPSA and Mr. Abdur Sabur, Program Manager of YPSA facilitated the orientation.